Zimbabwe opposition leader Morgan Tsvangirai has been released by police after being detained for about eight hours, his spokesman has said. He was freed without charge. Police had accused Mr Tsvangirai of violating public security for addressing a rally without authorisation. 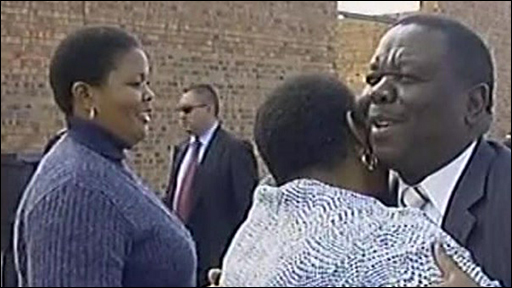 Mr Tsvangirai was detained as his convoy was going through a roadblock. The Movement for Democratic Change leader faces President Robert Mugabe in a presidential run-off vote on 27 June. 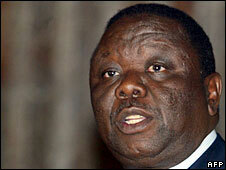 Mr Tsvangirai was held with his entourage at a police station in Lupane, a town in the west of Zimbabwe. His spokesman, George Sibotshiwe, said police had taken away an armoured car from the MDC leader's convoy. His arrest was heavily criticised by the US and European governments. Mr Tsvangirai said his detention was "nothing but the usual harassment which is totally unnecessary". "We have seen worse things than this," he said, in comments reported by the AFP news agency. The BBC's Caroline Hawley in Johannesburg says his arrest is part of an increasing campaign of political intimidation ahead of the run-off vote. Mr Sibotshiwe told the BBC that the incident showed campaigning was becoming "even more impossible". "Unless there are peacekeepers on the ground, unless there are a lot of observers on the ground, it's going to be impossible to run an election that is free and fair and that allows us room to campaign," he said. The MDC says 65 of its supporters have been killed in political attacks. In the latest violence, two MDC supporters were burned to death by suspected supporters of Mr Mugabe's ruling Zanu-PF. There are fears for the lives of four other MDC supporters after Tuesday's attack in the southern town of Jerera. MDC Masvingo provincial chairman Wilstaf Stemele told the BBC that Zanu-PF supporters had doused the blankets of the two men with petrol before setting them on fire. He said the victims had not yet been identified as their bodies had been burnt "beyond recognition". The government says the scale of the violence has been exaggerated and blamed the MDC for instigating attacks. Official results from the 29 March first round of the presidential election gave victory to Mr Tsvangirai, but not the 50% of votes needed to avoid a second round. The opposition leader then spent nearly two months outside Zimbabwe, trying to drum up international support. His return was delayed because of an alleged army plan to kill him, which the ruling party said was "fantasy". Mr Mugabe is currently attending a UN-sponsored summit on the global food crisis in Rome, where he blamed Western sanctions for Zimbabwe's economic woes. Some four million Zimbabweans - a third of the population - are believed to need food aid this year.